It’s Woozy Wednesday! Who’s got the aspirin? It’s been a rough couple of days in America. I don’t know about the rest of you, but every now and then I’ve had to take a comic book break just to keep myself from going crazy with anger and sadness over the senseless murders in Charleston, South Carolina. I can’t let you dig through my collection, but I can share this short strip by Evan “Doc” Shaner that always gives me a laugh, even at times like this. I hope it does the same for you. 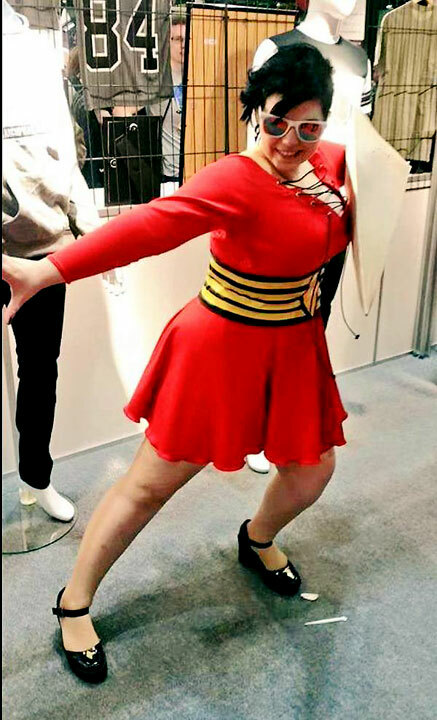 I’m a little late sharing this photo from Plasti-fan Claudia Jevons, but it’s never too late for some Plastic Man cosplay! And, man, do I love this “Plastic Lady” version she cooked up for the MCM London Comic Con a couple of weeks ago. The attention to detail is great, and I like the updated version of the classic Plastic Man haircut Claudia’s rocking here and the way it contrasts with the Golden Age-style skirt and shoes. It’s easier to see in her other pictures, but I also dig the stabby wedge she’s using to show off Plas’ shape-changing power. You can see more photos of Claudia’s Plastic Lady on her Twitter account, and be sure to check out the very cool 3D view of her costume taken at the con. I’m glad to see Plastic Man has fans in the United Kingdom! If it’s anything like France and its appreciation for Jerry Lewis, I’m moving to London. This is probably going to be a short review, because in all honestly I’m still a little confused by Plastic Man and the Freedom Fighters, and whatever this two-issue mini series was trying to do. 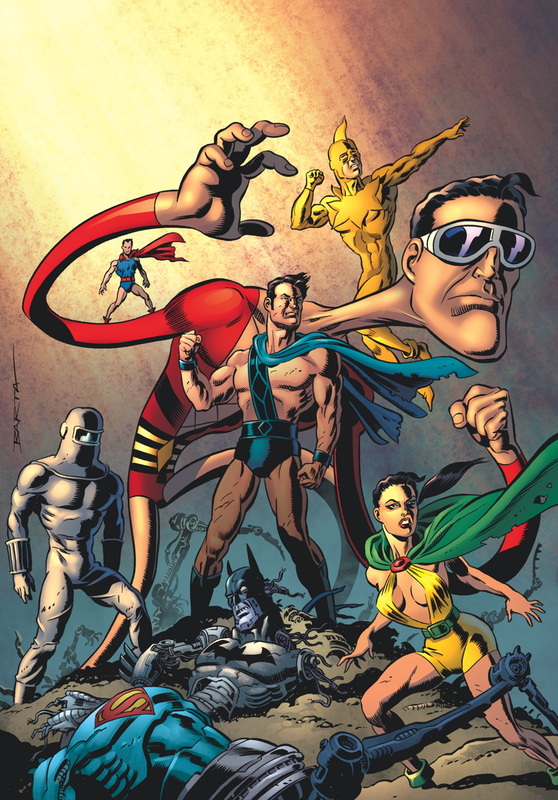 I can only guess that the mini was DC’s quick-and-dirty way of reintroducing Plastic Man to readers, and maybe setting up a new status quo for what I hope is the character’s return to a post-Convergence DCU. But as I said, that’s only a guess because the story itself doesn’t tell us much. The second issue opens with a brief recap of Plas’ origin and a neat look at his time at the Rest Haven monastery, where he not only learns how to control his power but where he’s also put on his personal path to redemption. From there we jump into a scene where the Future’s End superbots are wreaking havoc on a platoon of Nazis while the Freedom Fighters look on. How long have the robots been tearing through the city? How did the Freedom Fighters manage to complete their escape from the Nazi prison from last issue? How were the Axis soldiers able to mobilize so quickly (or did it happen slowly? The city looks wrecked, later), and why are the Freedom Fighters and the Silver Ghost so quick to ally with each other? None of these – or any other – questions are ever really answered, and transitions from scene to scene jump forward with a jarring abruptness. There are some fun fight scenes – artist John McCrea seemed to be having a little more fun this issue – and moments of light-heartedness, but for the most part the whole thing felt … shapeless. And surprisingly, this isn’t a great thing when it comes to a Plastic Man comic (or any comic, really). 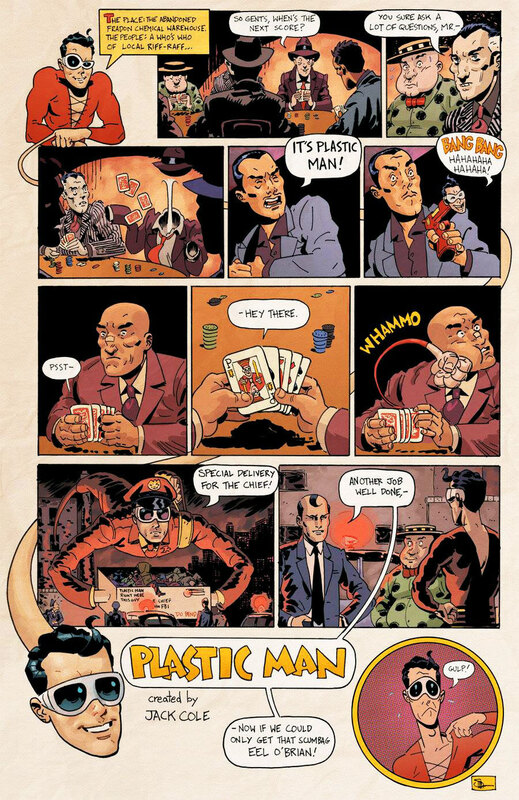 It made me wonder what writer Simon Oliver was shooting for, because while a reader could see points where the ideas of Plas’ atonement, heroism and questions of identity were being brought up, it was harder to see the writer who brought us The Exterminators and the excellent FBP: Federal Bureau of Physics. I suspect the problem is really with the editing, not the creative team, and I’d be interested in seeing what Oliver could do with an ongoing series where he could flesh out some of these ideas. Oh, and the rest of the Freedom Fighters? If you’re a fan of the team, prepare for disappointment as the gang makes what is essentially the best-marketed cameo in comic book history. 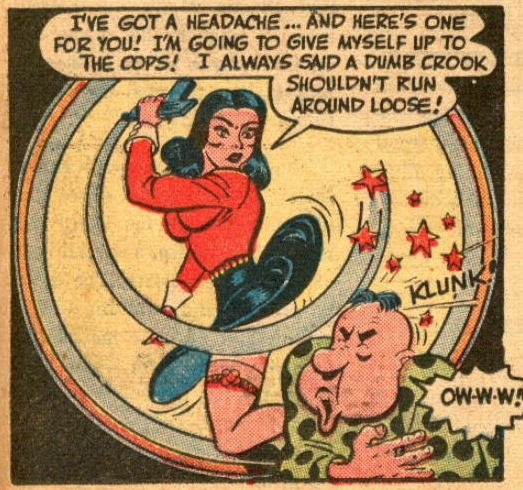 I do like Phantom Lady’s slightly more sensible outfit, though.